A Five-Year Financial Assessment Workshop is to be presented at 3 p.m. on Tuesday, prior to the regularly scheduled City Council meeting. The assessment forecasts revenues and expenditures to be used as a tool for the City Council, the public, and city staff to evaluate the city’s long-term financial condition. “It is a snapshot of possible fiscal outcomes and their impacts on maintaining the city’s current service levels and should complement other studies or forecasts that the city uses, such as the 10-Year Capital Improvement Program, the 12-Year Wastewater Capital Improvement Program, the Parking Management Plan and the two-year budget,” according to Administrative Services Director Gavin Curran, who prepared the assessment. The assessment is a forecast, not a budget and a projected budget gap or shortfall, and is not the same thing as a budget deficit. Strategic planning and decision-making can eliminate a budget gap, stressed Curran. The council will be asked to approve policies recommended by Curran to help guide the City Manager and the city staff in preparing and managing future budgets. Curran’s report notes that Tuesday’s presentation will include optimistic and pessimistic forecasts. In the most likely scenario, General Fund revenues are expected to grow at an annual rate of 3.4 percent, matched by an increase in expenditures. A goal of forecasting is to make sure deficits do not materialize and balanced budgets and acceptable service levels are maintained. However, increased pension costs and the possibility of a recession are significant concerns. A decision by the California Public Employees Retirement System to lower the discount rate from 7.5 to 7.0 percent will add roughly $2.8 million to the city’s budget by Fiscal Year 2023-24. Gavin’s presentation Tuesday afternoon will also include reviews of the Capital Improvement, Parking and Wastewater funds and will highlight some existing fiscal policies that help ensure long-term fiscal sustainability. 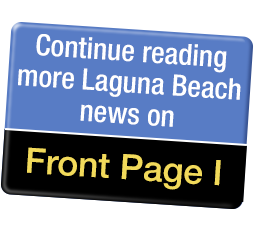 Laguna Ocean Foundation’s Kelpfest 2019 will take place on Saturday, April 27 from 10 a.m. to 3 p.m. at the south end of Main Beach. This free annual festival celebrates Laguna’s unique coastal ecosystem and provides information to visitors and residents on the importance of kelp in maintaining healthy coastal watersheds. Kelp provides essential habitat and an important food source for land and marine animals. “Debris Free Seas” is Kelpfest’s theme this year, with the festival highlighting actions communities and individuals throughout our watersheds can take to protect marine ecosystems and stop pollution before it enters the ocean. Environmental organizations providing activities, exhibits, and information include Orange County Coastkeepers, Laguna Bluebelt, Pacific Marine Mammal Center, One World One Ocean, and Laguna Canyon Foundation. The Ocean Institute, American Cetacean Society OC, Crystal Cove State Park, Laguna Beach County Water District, South Coast Water District, and California State University Long Beach’s Shark Lab will also be present along with entertainment provided by Tom and Gayle Joliet and the So Cal Sea Sisters. Laguna Ocean Foundation is a nonprofit 501(c)(3) organization dedicated to sustainable ocean ecosystems along the Laguna Coast. The calendar says it’s April but try convincing people from the Pacific Northwest to Denver to Minneapolis and all points in between. Relentless cold rains are battering the Northwest and full on blizzard conditions with up to two feet of snow with 60 mph winds and absolute zero visibilities are making things downright dangerous to even drive a block in other places! That’s why we live here! The snowpack in the Sierras is now at around 175 percent of normal, so they’re set for the year as far as available water is concerned. Local surface ocean temps are on the downswing as strong gusty northwest winds are resulting in widespread upwelling. That super bright object in the pre-dawn eastern sky is the planet Venus. On this date in 1975, Laguna recorded its coldest April low temp on record with 35 in town and 30 out in the Canyon, the latest date of the season with freezing temps out there. Laguna’s rainfall to date for the 2018-19 season is at 17.27 inches, well above the normal to date of 12.98 inches. Last year at this time, we were at a measly 4.32 inches. Last season’s total was a paltry 4.71 inches, the fourth driest on record. The driest was 3.71 in 2006-07. The second driest was 4.30 in 1960-61 and the third driest was 4.42 in 2001-02. Going way back into the 1800s, it was found that Downtown L.A.’s wettest season was 1883-84 with 40.06 inches. The driest for L.A. was 3.41 inches in 2006-07. The winter of 1844-45 saw up to four inches of snow there. In September of 1858, a Category 2 hurricane made landfall near San Diego thanks to a powerful El Nino that saw water temps soar to 80 degrees, which fueled that storm and enabled it to maintain hurricane strength all the way up to latitude 33 degrees north. Hardly anyone was around way back then but if that event happened now, it would be total chaos. That kind of event will surely happen again someday. We just don’t know when but nowadays there will be more than sufficient warnings. Have a great weekend. It should be a nice one, ALOHA! As the city’s primary community center, the Susi Q management is one of the locations that can be called on at a moment’s notice to set up as an evacuation center during floods, fires or other local emergencies. With this in mind, the City of Laguna Beach Community Services staff held its second annual Emergency Shelter Drill on January 3, along with 24 members of Laguna Beach CERT who teamed up to practice setting up a shelter. “The drill consisted of a complete set-up of the facility as a shelter followed by a mock exercise using a variety of scenarios,” said Patty Quilter, Program Coordinator for Laguna Beach Community & Susi Q Center. Initially, CERT volunteers acted the part of evacuees coming in to stay. Each “actor” had a scenario to be addressed that ranged from pets brought along, to concern about their homes, to arrangements for meals. Staff took turns practicing proper “intake” procedures, escorting “evacuees” to rooms for meals, rest or medical attention – or to settle their pets in the animal shelter area. At the end of the exercise, CERT members and Susi Q staff compared notes about what went smoothly, what could use more work, additional supplies that could be useful – and ideas to streamline the process. One proposal was to move the intake area slightly so newcomers wouldn’t be so close to the main doors; another was to take photos of evacuees with their pets before settling in the separate human/pet areas. Discussion for the future also included a possible need for additional bilingual services. “Staff greatly appreciates the continued participation of the CERT team members,” Quilter said. “Without their support, we would not be able to serve our community during emergency situations,” she added. Just weeks later, the Susi Q was officially opened as an evacuation center when severe rainstorms caused flooding downtown and led to immediate evacuation orders for parts of Laguna Canyon. Set-up went smoothly, but surprisingly, few evacuees showed up. Ramona Loucks, who lives near the Susi Q Center, was one of the first CERT members to show up for the activation, but because all the equipment had not yet arrived, she was put on call to return at 4:30. “By then, the emergency was cancelled,” she said. Nevertheless, Loucks was glad she responded. “I had no hesitation on responding after going through shelter training,” she said. “My training gave me confidence that I could help set up the shelter activation after the recent rainstorm.” And that’s exactly why we hold training and refresher classes on a regular basis. On Friday, April 12, the Laguna Beach Garden presents Maureen Gilmer for the group’s monthly Speaker Program at the Laguna Presbyterian Church. Social hour starts at 9:30 a.m. and the General Meeting at 10 a.m.
Gilmer will discuss California Plants: An Historic & Holistic Approach. She has written books about native and exotic plants that established our historic aesthetics and horticultural vernacular. This past year of epic fires and floods led Gilmer back in California history for a better sense of how weather, plants, and human beings are all part of a holistic picture. The early eras of California found Native Americans participating in horticulture and land management. It saw Spanish influenced Indian burning and the mission gardens as sources of early food crops. As America moved west during the agricultural period, followed by the Gold Rush and the 19th century’s explosive growth, the aesthetic of California communities was established. Discover the important plants and the little known secrets to their value in design and indigenous life. You’ll never see them the same way again. Gilmer, a native Californian, will share her love for the state, its wildlands, plants, and gardens in a holistic view of the future, via our very own past. The talk is based upon her book Redwoods and Roses, The Gardening Heritage of California and the Old West, scheduled for new edition release 2020. The public is welcome and there is no charge for guests on their first Laguna Beach Barden Club General Meeting visit. Before or after the meeting, guests are invited to browse the outdoor “Garden Boutique” where donated garden-related items and plants can be purchased at “dirt-cheap” prices. Parking is free in the Laguna Canyon Road lot (spaces 300-422) or $3 for all day in spaces 185-228. For more information on the garden club, visit www.lagunabeachgardenclub.org. The Laguna Presbyterian Church is located at 415 Forest Ave. Historically, atmospheric rivers that invade the Pacific West Coast have always occurred during the months of December, January, or February, but never in April, until now. Currently, there’s a 4,000-mile-long moisture-laden river extending from well to the southwest of Hawaii plowing northeastward across the Pacific and targeting an area from Point Arena, California to Portland, Oregon – including truckloads of rain with amounts exceeding 8-10 inches in some areas. The most heavily affected area is from Point Arena to the California-Oregon border, which is an area that doesn’t really need any more rain as many communities have shattered seasonal records. Down here, we’re escaping all the madness with only partly cloudy skies with seasonable temps. It’s warming up in some desert regions of the Southwest as Phoenix, Arizona logged its first 90-degree day of the year today. The record April high temp in Phoenix was 105 in April of 1992. The highest temp ever recorded in Phoenix was 122 in June of 1990. Tornadoes are really ramping up in parts of the Southern Plains with several EF-4 twisters with winds of 165-200 mph. Did you know that some tornadoes pack the strongest winds on the planet? In 1999 an EF-5 twister hit central Oklahoma with winds up to 308 mph! Did you know the widest tornado ever recorded was 2.6 miles wide in a place called El Reno, Oklahoma in May of 2013? The myth is that the wider the twister, the stronger it is. There have actually been twisters that are only a couple of hundred yards wide that had winds in excess of 175 mph. Did you know that a tornado has occurred in all 50 states? Believe it or not, Great Britain has more tornadoes per square mile than Oklahoma! In 1983, an EF-2 twister touched down near Fountain Valley, California. Heck, that’s just 20 miles up the road from us! In Alaska, an EF-2 twister touched down in the Tanana Valley near Fairbanks in June of 1992. The Big Island reported two EF-1 twisters in 1997. When I was in Air Force Weather School in Amarillo, Texas I witnessed firsthand an EF-4 tornado that just barely missed our barracks back on April 1, 1967. I love severe weather. The more radical, the better. Tornado chasing is really fun but it’s equally as dangerous. When I first did that it was way back in May of 1971 in Oklahoma, but we didn’t have the technology like we have today, so we were pretty much on our own. Doppler Radar wasn’t even close to being part of the weather vocabulary, yet we lost four professional chasers in the El Reno event in May of 2013 when the 2.6-mile-wide monster suddenly broke all the rules and made an abrupt turn to the south. Tornadoes most always move to the east or northeast. They couldn’t get out of its way quick enough. They died doing what they loved doing, no matter what. What a way to check out! Red flowers represent the matter of the heart. Red is the color of blood, the sign of liveliness, and the sign of life. Hence, the matter of heart and life is regulated and represented by red flowers. Red blooms also represent strength and courage. They exude energy and positivity.